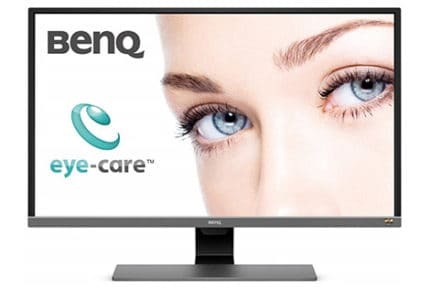 The BenQ EW277HDR is an affordable 27″ 1080p monitor with the entry-level HDR support which will provide you with a recognizable boost in image quality for HDR (High Dynamic Range) content making it ideal for watching movies as well as playing PC and console games. First of all, the monitor is based on a VA panel with true 8-bit color depth, a wide 93% DCI-P3 color gamut, and a high 3,000:1 static contrast ratio. Furthermore, using the Brightness Enhancement technology, the BenQ EW277HDR can boost its peak brightness up to 400-nits for HDR content, up from 300-nits for SDR (Standard Dynamic Range). When all these things add up, you get a vibrant picture quality with vivid details in the shadows and highlights of the image with deep black colors. Now, the 1080p resolution is fairly low for the 27″ screen of the BenQ EW277HDR monitor which results in a low pixel density of 81 PPI (pixels per inch). While this causes text to be somewhat smudgy and blurry, it’s not noticeable in video games and movies which is why we don’t recommend the monitor if you use your display to read or type a lot. Finally, the BenQ EW277HDR VA panel monitor has 178-degree wide viewing angles which ensure no prominent shifts in brightness, contrast, and color when the image is viewed from skewed angles. Moving on, the BenQ EW277HDR input lag performance is impressive with only ~4ms of delay at 60Hz. The response time speed also amounts to 4ms which is the time pixels take to change from one color (or shade of gray) to another. Overall, there isn’t any particularly noticeable ghosting or trailing visible with fast-moving objects though there’s some minor smearing when the dark pixels are dominating on the screen. Regardless, the monitor is perfect for gaming on Xbox One S/X, PS4/Pro, and PC, especially if you’re playing HDR-compatible video games. 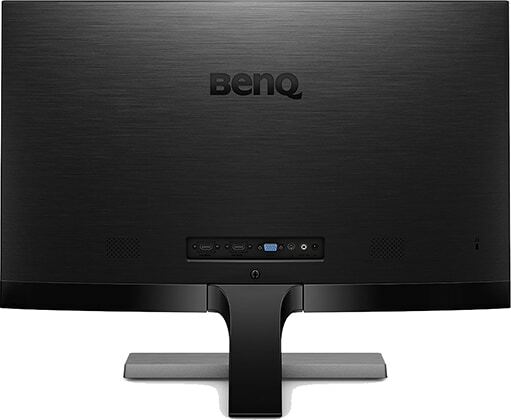 The BenQ EW277HDR has the same features that are present in some of the previous BenQ monitors, such as ‘Super Resolution’ and ‘Smart Focus’. The former increases pixel density of low-resolution content while the latter allows you to brighten up a selected area on the screen for better focus and fewer distractions. Additionally, the monitor offers the exclusive Brightness Intelligence Plus technology that automatically detects ambient lighting via the integrated sensor and adjusts the screen brightness and color temperature accordingly (click on the image above for a demonstration). 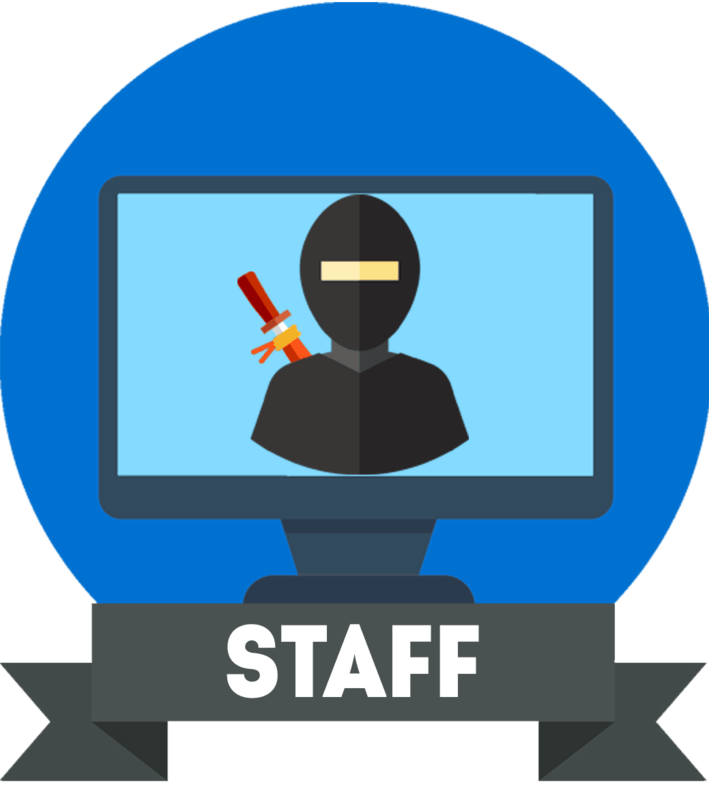 There are several different sensitivity levels and working modes. For instance, the brightness can gradually increase or decrease as you work long into night. 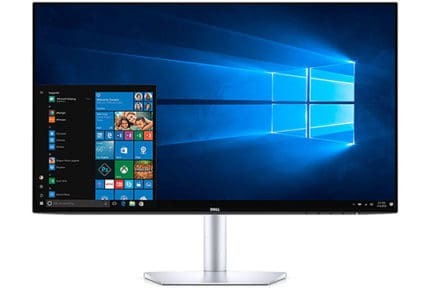 In addition to the flicker-free screen and four different low blue light levels (MultiMedia, Web-Surfing, Reading, Office), you can use the BenQ EW277HDR display for as long as you’d like without worrying about eye strain. Lastly, clicking the monitor’s hotkey labeled as ‘HDR’ allows you to switch between four different HDR and B.I.+ presets. You can also use ‘HDR Mode’ to emulate HDR for non-HDR content. The BenQ EW277HDR features a simple and elegant design with a metallic-gray finish. However, the monitor is tilt-only by -5°/15° and it’s not VESA mount compatible. Turning to the connectivity, there are two HDMI 2.0 ports, a VGA, a headphones jack, and an audio line-in for the two 2W built-in speakers. 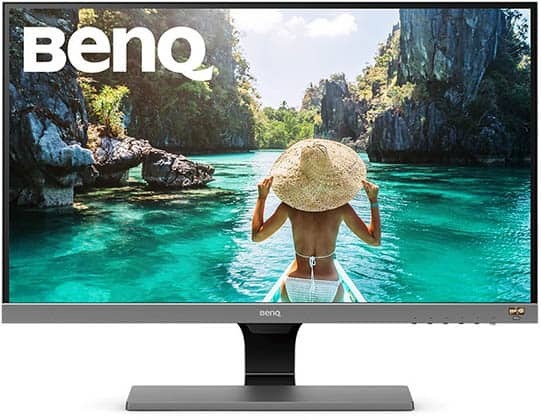 The BenQ EW277HDR price amounts to $200 MSRP which is an appealing price considering the monitor’s picture quality, performance, and features. You may also be interested in our dedicated buyer’s guide with the best monitors for Xbox One and PS4. Overall, the BenQ EW277HDR is the best budget HDR monitor for casual PC gaming, console gaming, and watching movies. For purposes other than that, there are better alternatives. 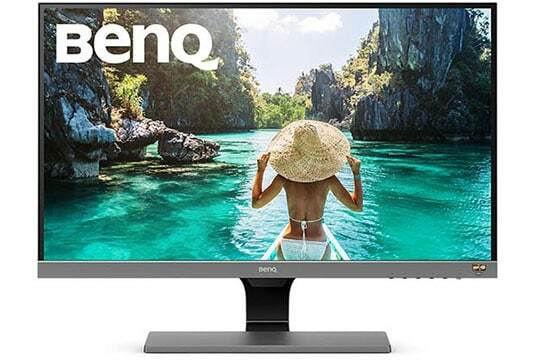 The BenQ EW277HDR is an affordable 27" monitor that's perfect for watching movies and gaming. It also offers plenty of useful features and an immersive HDR viewing experience.